Muscle Soreness: What’s Normal and What’s Not? July 26, 2017 By Chris Freytag & filed under Blog. Right after a vigorous workout, you might feel a number of things—proud, sweaty, and more confident, to name a few. Your muscles, however, usually wait a day or two to say how they feel about things. This is called delayed onset muscle soreness, and it typically occurs 24-48 hours after you’ve done a challenging workout. But how sore is too sore? Can you workout the next day even if your muscles are in pain? And wait, what does it mean if you’re not sore? Get ready to learn everything you’ve ever wanted to know about muscle soreness and exercise. Why Am I Sore The Day After A Workout? 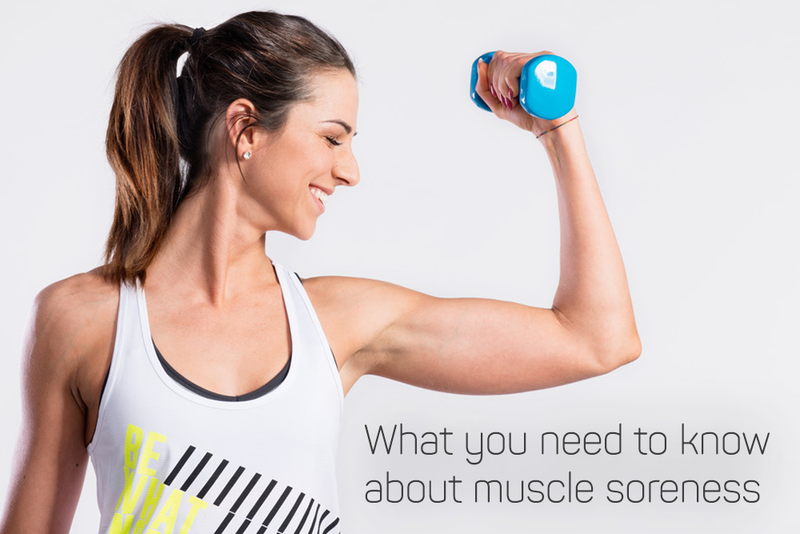 Within reason, muscle soreness is a good thing! It means you’ve challenged your muscles. Muscle soreness occurs when you actually create micro-tears in the muscle fibers, causing them to repair themselves and, in the process, get stronger. And to tone your body and keep your metabolism revved, you need muscle. How Often Should I Feel Sore? To keep your metabolism engaged and your muscles strong, you should challenge your muscles every week or two by doing an activity or reaching an intensity you don’t always attempt. For example, if you’re a runner or hiker, give a bodyweight interval workout a try for a change. Instead of the steady state cardio you normally do, this type of workout utilizes short bursts of all-out effort paired with brief moments of rest, challenging your muscles. If you’re always amped for leg day when you strength train, try to challenge your upper body for a change. Whatever you do, keep mixing it up to maintain a healthy weight, strong muscles, and a well-rounded fitness level. By doing this, you will feel sore occasionally when you attempt something new, but not every single day. Can I Work Out If I’m Sore? If you’re experiencing muscle soreness in a particular area, you might want to work on a different area the following day to let those muscles repair and grow stronger. But that doesn’t give you a pass to be inactive—just do a different type of workout! If you have the type of muscle soreness where you feel like you can’t even lift your arms, can’t walk, etc., then definitely rest for a few days! (Or if the soreness persists for longer than three to four days, get it checked out by a doctor). If you’re NOT sore, feel free to work the same muscle group you did the day before if you want. A great way to add variety to your workouts and challenge your muscles in new ways is to follow a workout calendar! Our 28-day workout calendars provide you with tons of variety for whatever goal you currently have, whether it’s to lose weight, build muscle, get in shape after pregnancy, or train for an athletic event. Instead of doing the same workout every day and not seeing results, our workout calendars give you different workouts each week so you won’t get bored—and neither will your muscles! Check out our entire library of workout calendars here! why won’t it download, I am a member? Yes, I do show that you are a Gold member with GHUTV. Thank you for letting us know that these downloads are not working correctly. I have submitted your request to our Development team and they are currently working on getting those links update and the issue resolved. We hope to have them updated in -2 business days and we appreciate your patience! really enjoy your articles, thanks for the information.